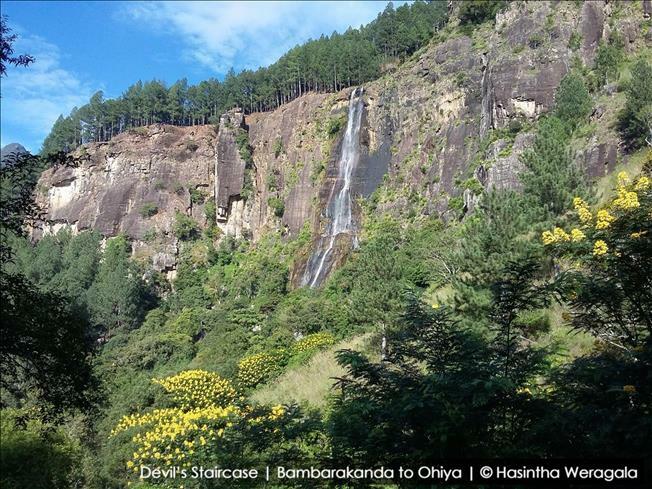 The scenic Devil’s staircase trail is a well-known secret among the adventure loving locals and foreigners as well. 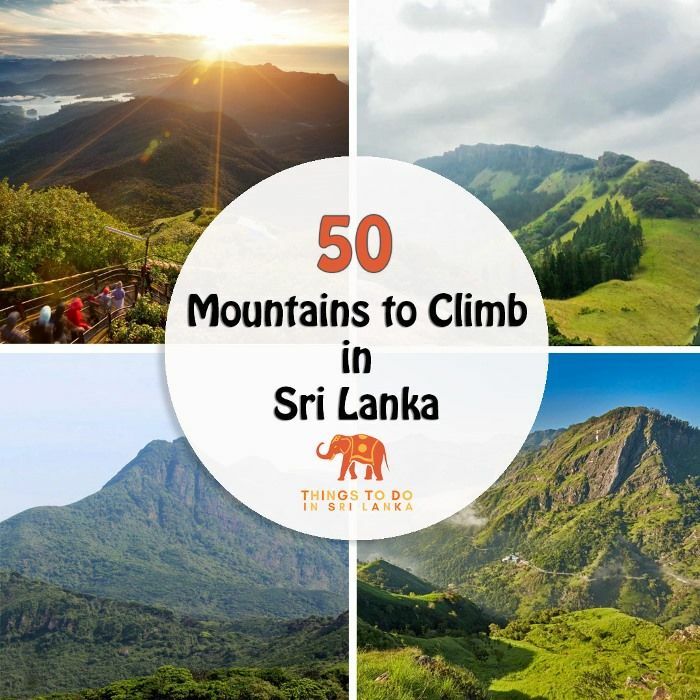 It is adorned with utter serenity of the hill country of Sri Lanka has to offer. People usually start from Ohiya and go all the way to Bambarakanda or Kalupahana, which is much easier if you’re on foot since It is mostly down the slope. 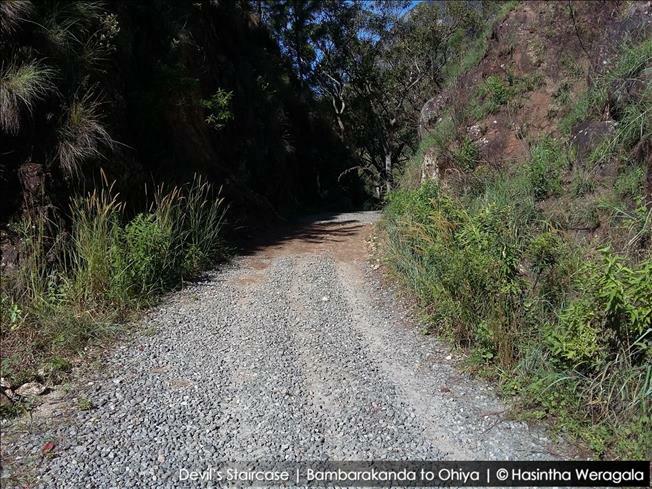 And it is common for people to traverse this rough path using a 4WD vehicle or bikes as well. I am an avid railway fan and wouldn’t miss a chance to travel by train. 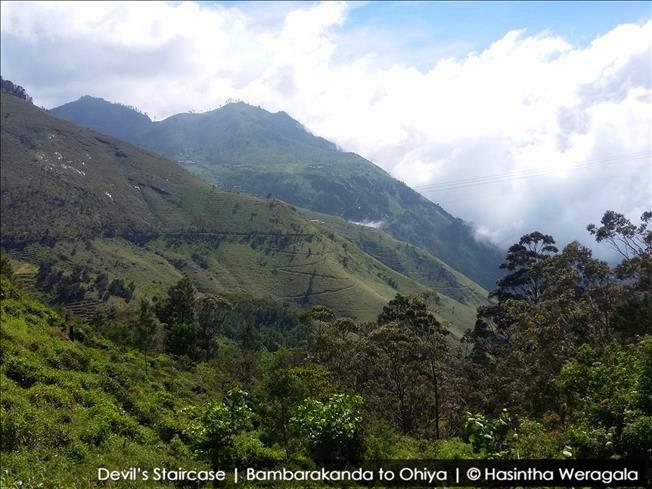 I got on board the Badulla train and engorged myself in the blissful scenery for which this particular line is famous in the world. So I started my journey from Colombo fort by the 08.30 AM train (Udarata Menike). This is one of the 04 trains that you can take to Badulla from the Island’s capital. Make sure to book train tickets at least about a month ahead. Tickets cannot be booked online and thus you should get someone in Sri Lanka to reserve them for you. These trains are in high demand hence get fully booked pretty quickly. Especially in school holiday seasons (April, August and December). I originally planned to reach Ohiya and spend the night there but, we were informed by my homestay host there was some viral flu spreading through the area, so I dropped the plan A and moved on to plan B. Plan B is to start the hike from the other end. That is I shall start from Bambarakanda and end in Ohiya. Since I intended to travel by train the only way to do that was to reach Kalupahana via Haputale. After the scenic and utterly refreshing train journey which would require a dedicated article, I got off at chilly Haputale station and went on to find out lodgings for the night. 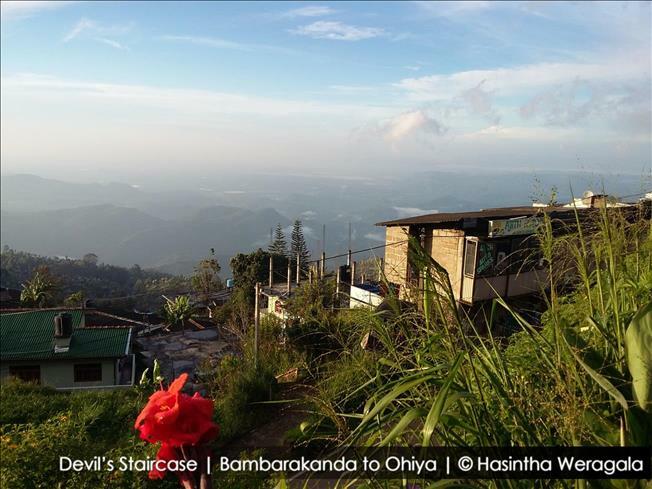 You’ve probably heard about amazing things about the hill country train ride in Sri Lanka. It is as serene as advertised. It is always so easier to locate things on Google Maps but in reality, it is anything but. A friendly tuk-tuk driver delivered me to the guest house which was so close to the town but hidden in a small road down a slope. Haputale is a small town with outstanding views of southern plains. The town itself is boring and pretty laid back, so we didn’t wander around much. It was pretty cold and that didn’t help either. In the next morning I was really excited about the journey ahead and, hastily left the guest house at around 06.30 am to catch a bus to Kalupahana. To reach there I needed to get into a bus travelling to the general way of Colombo. After some 10 minutes, there came a bus to Panadura and I hopped in. Since I hadn’t travelled this way I was very vigilant in looking out for any signs of Kalupahana. After a hectic bus ride through winding Badulla-Colombo main road, I got off at the small (Smaller than I thought) Kalupahana junction after about ½ hour. Please ask for the conductor’s help since there is a high chance that you miss this bus stop. The Amazing views towards the southern plane along the road don’t help as well. There is only one small store in Kalupahana so make sure to bring everything you need before you get here. From Kalupahana I took a three-wheeler from the junction to Bambarakanda falls. 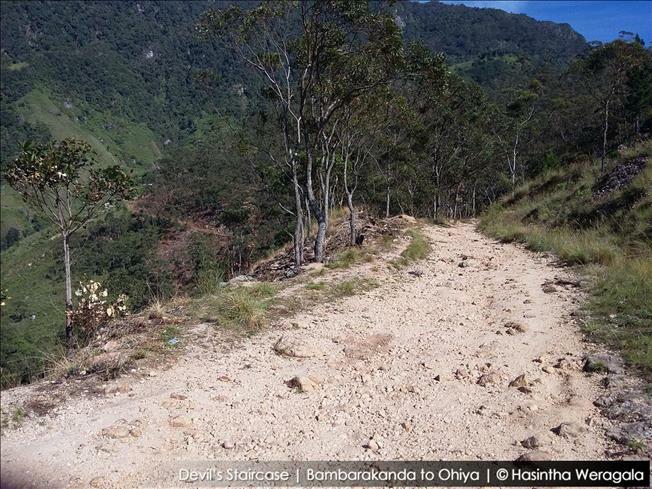 Although you could hike this 07 km without much hassle, it doesn’t offer much scenery. About 15 minutes later I was dropped at the entrance to the falls. The ticketing counter was still closed, so we ventured in. Ticket price for a foreigner is 150 LKR. To reach the base pool of the fall you need to walk through a small but well-maintained path. After reaching the stream which carries the water from the fall, there is an ascent through a pine forest which is well paved with concrete stairs. About 50m in you’ll come across a junction which is used to climb atop the fall but this is prohibited due the danger and recommend avoiding it unless you’re a seasoned hiker. After about 05-10 minutes ascension through the pines forest brings you to the base pool. The beauty of the fall is as advertised. The whole base pool area is covered in droplets of water and the sheer height of the fall is dumbfounding. Water is cold and perfect for a dip. It is advisable to bathe in as far as possible from the base pool. There is an observation deck built to get a perfect view of the giant fall. Water level varies with the time of the year. In November the stream was getting a decent rainfall above hence the fall was in a decent form. If you ventured here in August, instead, there would only be a faint stream of water. Keep in mind that the best time to visit is between September to March. After spending sometime loitering around the base I proceeded with my main journey and reached the curved road towards Ohiya. The ever beautiful waterfall adorned our scenery for a long period that I couldn’t help but admire it. The faint sound of the majestic waterfall lingered in our ears for some time. The road at the beginning is lush, serene and well-paved since there are some small lodgings and houses spread around. There is a nothing but ascent up until the famous V-Cut so up I went admiring the view of nearby peaks. Only the sounds of birds and our footsteps could be heard. A little by little road started showing signs of poor maintenance and eventually reduced to a rubble of stones. On the way, I reached the little stream which feeds Bambarakanda falls. 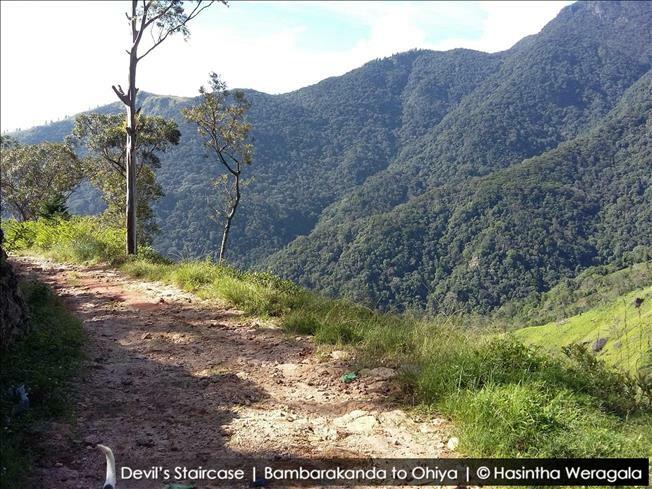 This originates from Horton plains and joins Walawe River after. Water was ice-cold and it was a perfect place to rest a little bit. By the time I reached the famous V-Cut the sun was shining but it wasn’t hot and the views are getting better and better. V-Cut had been given its name due to the shape which it was carved to construct the road. After travelling about half an hour more on a flat terrain I reached an inhabited area which confirmed that I was now in the Udaweriya Estate. I met a few plantation workers on the way and greeted them as they passed by. They are innocent people, don’t forget to smile and talk to them. They undertake this arduous journey occasionally to reach Kalupahana and Haputale areas. The path again makes for a gradual ascent towards the inner estate area but the quality of the road leaves a lot to be desired. Now I was traversing through the lands of tea and tea plucking woman carrying bags of tea leaves are a common sight. Mountain ranges towards Haputale appeared on the right side with until you reach valley that curves around the mountains. You can see the road ahead on the other side. Views are breathtaking. 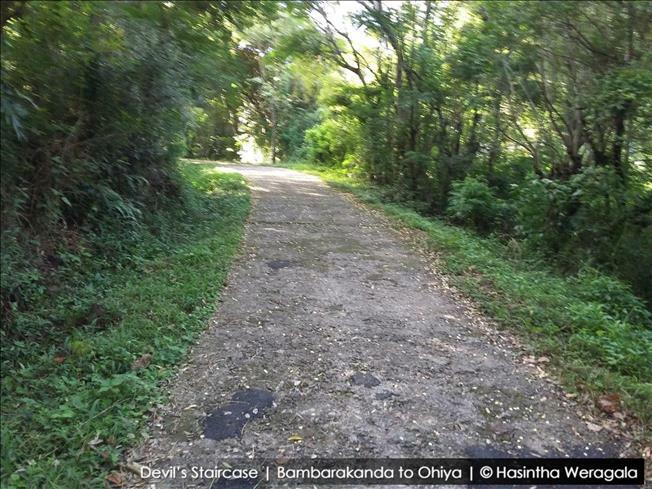 Once you make the curve to the other side there is a shortcut where estate people call double cut taking which you can reach directly to the Ohiya — Horton Place road. This road has a steep ascent, and I moved on the main road instead. I shall try this road another day from Ohiya side. The road condition is still terrible and flat but was getting better when I saw a deep ravine and a tall waterfall which I assumed to be Uduwara falls. Unfortunately to get a closer look of this fall would be another hike itself since is located away from the road. After another ½ hour walk brought me to a much-populated area in which I saw a factory and a lot of small houses which belong to Udaveriya estate. The strange thing is I didn’t see many people around. I met an officer from the factory and had a friendly chat with him. He showed me the road we have to travel pointing to a summit nearby. Even though the view is supreme, I think my aching legs didn’t like that much. To make the matter worse the sole of my right shoe completely detached from the shoe. The steep ascent began gradually towards Ohiya and the road was better, so I walked slowly me half limping with my sole-less shoe. I met a few small trucks and tuk-tuks along the way. The curving roads took me higher and higher delivering magnificent views of hills towards Haputale to the right and Horton place to the left. Just past an abandoned, rambling house I finally reached an area covered in pine trees and felt a sense of awe. Not a sound to hear not even a bird. The environment boasts a blissful serenity. The junction where Kaupahana and Horton Plains roads meet was a sight to the sore eyes since this means I was not far away from Ohiya. 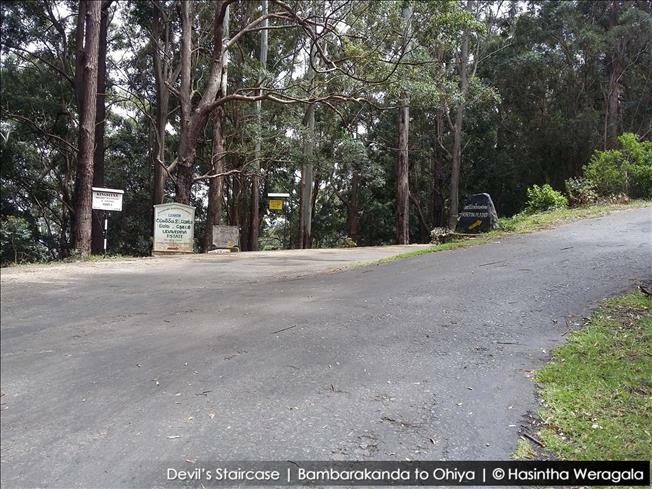 The road to the right leads directly to the Ohiya entrance of Horton Plains. And what’s more, it’s down the slope from here on a wide road indulging the cool breeze sweeping the pine trees. After a ½ hr of following this road, I finally glimpsed the signs of Ohiya railway line and the station through the hedges. So the time was around 12.30 PM when I reached the station and got into a small shop in front of the station to get some food in and give a rest to my aching legs. Ohiya is a small hamlet where there are only two shops and the station. There is a train to Fort around 12.40, but I missed it since I was not in a hurry to do anything. If you’re travelling by train make sure to book ahead at least a month ahead to avoid the hassle. 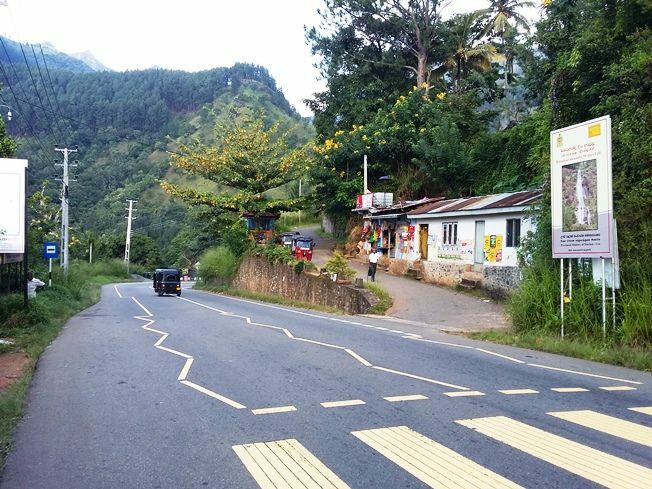 If you intend to travel by bus, take Colombo – Badulla (99) and get off at Kalupahana junction. Wear shoes with strong soles with tight grip since the road is strewn with hard rocks. I learned this hard way. 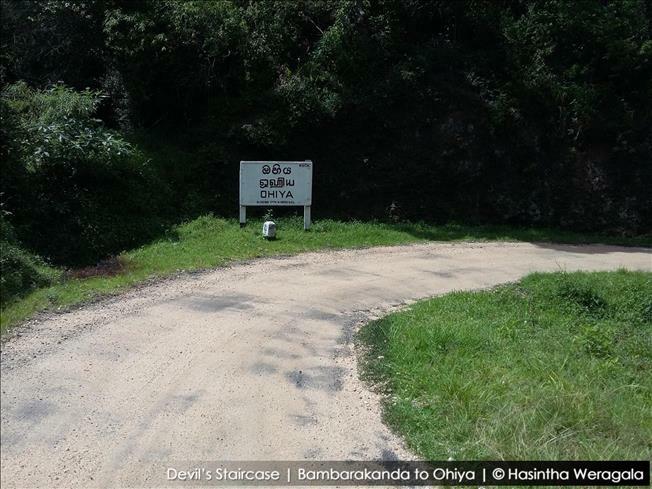 Bambarakanda to Ohiya road has a higher elevation than the other way. Although this is not a strenuous ascent. 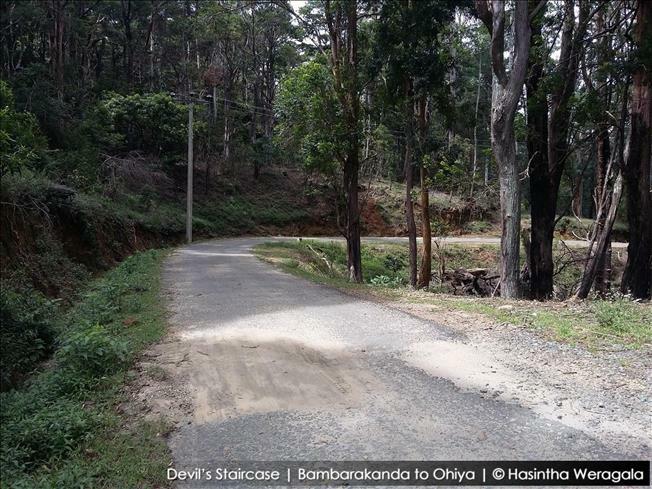 The distance from Kalupahana to Ohiya is 21 Km and from Bambarakanda it is around 15 Km. although you can ask for shortcuts from the estate people to reduce this distance. Keep your pack as light as possible. Water streams are available along the trek but keep at least 01 liter with you. 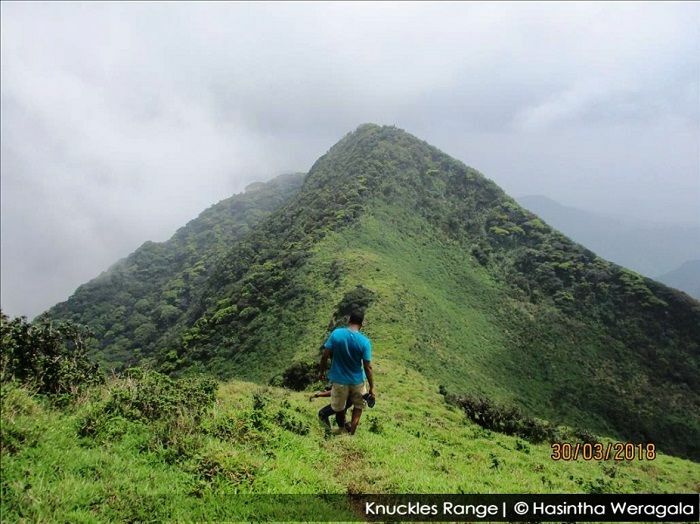 Do not attempt the hike alone and accompany a person who knows the path as there are various junctions and side roads which would lead you nowhere. Estate people are Tamil and hardly speak Sinhala let alone English.